A growing collection of vintage robin drawings. These copyright free and public domain bird images of that wonderful harbinger of spring, the robin red breast, are downloadable and ready to be added to your creative projects including scrapbooking pages, mixed media art and web pages. 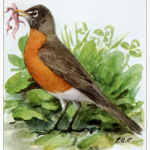 Fuertes illustration of a robin with a bunch of worms. 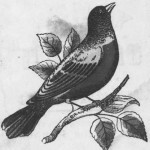 Black and white drawing of a robin perched on a branch. Colored drawing of a perched robin. 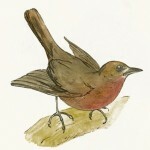 Vintage drawing of a robin red-breast bird. 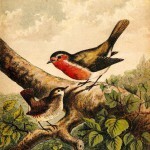 Full color book illustration of a robin and a wren in a tree. 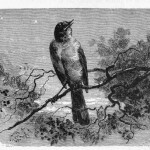 A lone robin sings to the stars in this vintage image. 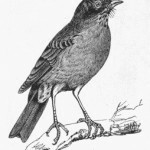 Detailed black and white drawing of a robin. 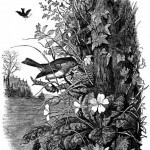 Black and white drawing of a robin and her nest. A mamma robin feeds her babies in the nest. A tiny vintage drawing of baby birds that would be great for inchies or other small art projects.